Here are ControlledSpin's ratings and reviews. These ratings are useful because ControlledSpin has his/her own standard and will rate and review the ping pong equipment accordingly, giving you accurate and useful ratings and reviews to aid you in your next online purchase. 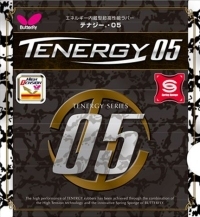 Tenergy 05 is simply the best pure looping rubber in the world even 10 years after its introduction. It's also still the world standard for non-Chinese professionals and aspiring professional players. The first time I looped with T05 it brought a huge smile to my face, it's a special and unique rubbber indeed. It's fast, but not crazy fast, and has an extremely high throw angle which coupled with its bouncy sponge and grippy topsheet create a perfect looping machine. However, the high throw angle and bounciness that make it such a great looping rubber also make it more challenging to use in the short game. Pushes are easier to pop up high or go long and service return can be difficult unless you are experienced in reading spin. That's why this rubber is more recommended for advanced to pro level players as they can easily mitigate this rubbers weaknesses through ability and practice while fully taking advantage of its outrageous spin and loop potential. Highly recommended for advanced looping attackers. A lot of people just look at this as Tenergy-lite but if you evaluate it on its own merits it’s a really excellent rubber for those looking for a balanced attack with good control and consistency, while still being dynamic with good spin and speed. It has the same spring sponge as the Tenergy series, my best comparison being a slightly softer and more forgiving Tenergy 80. It’s throw angle is similar to MX-P or just less than T80 on the Tenergy scale. It also has relatively good spin and speed being just a notch below the most aggressive attacking rubbers. The other criticism I’ve heard of this rubber is that’s it’s “jack of all trades, but a master of none.” While it doesn’t quite match the spin and looping ability of Tenergy 05 or speed of Tibhar MX-P, if your game is more than just pure looping and utilizes blocking, control, and placement (and you like Butterfly’s spring sponge) then this is an excellent rubber you should give serious consideration. There's nothing you can't do with this rubber. It offers the dynamic attacking feel of Tenergy while being less spin sensitive and easier to use in the short game. A very tacky, spinny, hard Chinese rubber that can be used by beginners all the way to the professional level. Not that heavy. The tacky rubber along with aggressive brush strokes can produce unmatched spin on loops. It's lack of catapult or bounciness also makes it great for serving and pushes. However it's extreme grip can also make serve returns more challenging if you misread the spin as it is very spin sensitive. Unboosted it's a great rubber to learn to loop with along with a flexible all wood blade. 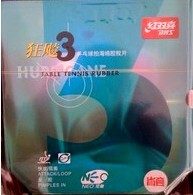 Boosted with Haifu Seamoon (my recommendation) it becomes a powerful mid distance looping tool to compete with Tenergy 05 at the advanced and Pro levels. If you want to try a Chinese rubber to compare against the Euro/Jap tensors try this one. I'd recommend for use on the FH side with a softer and faster Euro rubber on the BH. This is a seriously great FH rubber: its in the same league as Tenergy and MX-P. In the recent past I've used primarily Tenergy 05 or Tibhar Evo MX-P and Yasaka Rakza 7 for a good time prior so I will use them as my primary comparisons. 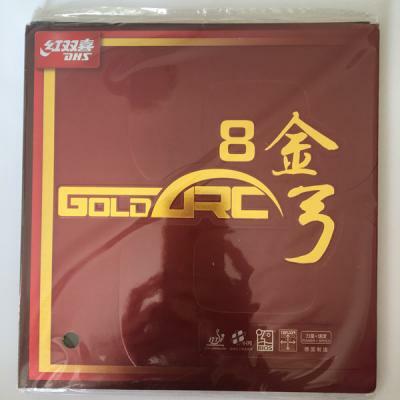 I think my best comparison would be to describe Gold Arc 8 as a slightly faster and spinnier version of Razka 7 with a slightly higher throw angle. 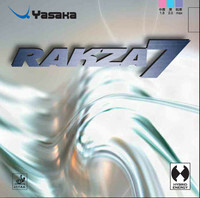 Basically an upgraded Razka 7 for the 40+ ball. For T05/MX-P users it has more in common with MX-P being slightly slower with similar spin and a tad higher throw angle. It does everything well with no glaring weaknesses: Opening loops, counter loops, blocking, pushes, flat hits, serves, serve returns are all excellent. Tenergy 05 is still a little stronger as an all out pure looping rubber and MX-P is faster but GA8 provides excellent spin and speed in an overall excellent and balanced rubber that is great for mid distanced looping attackers. If you are a pro or an aspiring pro T05 is still probably the best choice but for amateurs I think this is the better overall rubber. Recommended. 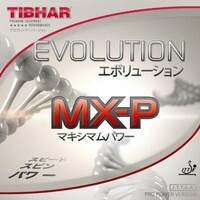 Tibhar MX-P is a great attacking rubber for offensive players. I will just confirm what many have already said: that if you are a Tenergy 05 user your transition to MX-P will be fairly easy. While they don't feel exactly the same their performance is similar using the same technique. 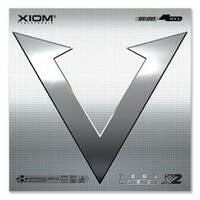 MX-P is a tad faster and harder than T05 and the throw angle is lower. In terms of spin, I think they are fairly similar but T05 is still more spinny on brush strokes with MX-P being equal when the sponge is fully engaged. While I still feel T05 is the best pure looping rubber because of it's higher throw angle and increased bounciness I feel MX-P is the better overall attacking rubber. MX-P has better control and consistency than T05 that results in a superior short game including pushes, blocks, flat hits, and serve returns. It has that advantage while still being 95% as good as T05 in the looping department. An excellent rubber and value. It can be played on either FH or BH but I personally use it on the BH as I prefer a slightly higher throw angle for my FH. Recommended. I really like this rubber. It does just about everything well and is easy to use. 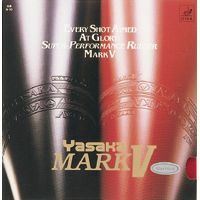 It's the first tensor I used after transitioning from Mark V as a developing player. Good speed and spin with great control and consistency. Excellent for blocking, flat hits, serve return and pushes. Pretty good for looping and serves. The high throw angle makes lifting backspin fairly easy. Can be used effectively on either FH or BH. Not the fastest or spinniest but a good choice for an all around tensor that is highly consistent with good control.